By Donna Belcher McGlasson on September 2, 2013 Visit Donna's Website. 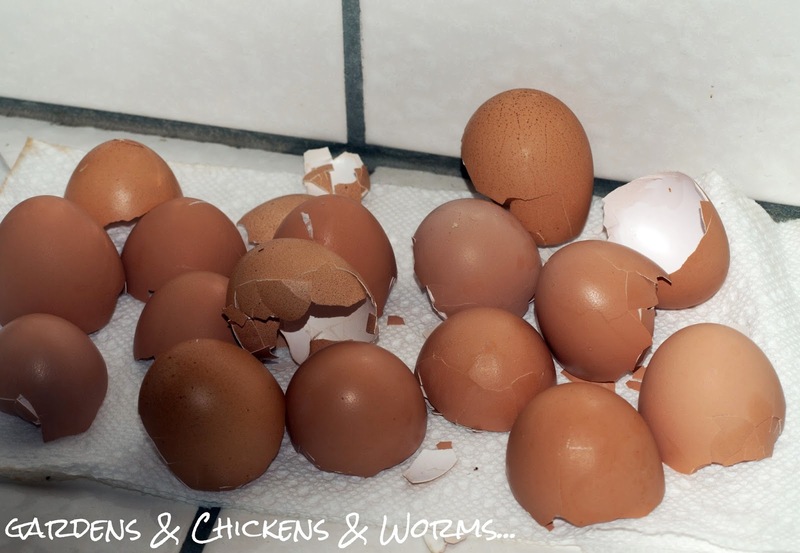 Laying hens need calcium to lay and have strong shells. A healthy diet and a separate container with a calcium source are very important to offer your girls. If your laying hens do not get enough calcium, their bodies will pull calcium from their bones and this is obviously not good for the chickens. A lot of folks, including myself, offer crushed oyster shell that can be bought where you buy your feed. Or, you can feed them their own crushed egg shells which I also do. It seemed a bit odd to me to feed them their own egg shells, at first. However, it is a really great source of the calcium they need and they seem to prefer them. Why do I offer both oyster shell & eggshells? Because when they molt they don’t lay eggs. When they are broody they don’t lay eggs and when they hatch chicks, it usually takes them about five to six weeks to start laying again. When egg production is low, I can use the crushed oyster shell as a substitute. I will say this, I did a little test to see what my girls would do if I offered both at the same time. Guess what they chose? Their own eggshells! They will eat the oyster shell only if they don’t get eggshells after a day or two. Here’s how I give them back their own shells. First, when we use the eggs we rinse them really well and leave them on a paper towel to dry. Then, I store them in a kitchen counter compost bucket until I need them or the container gets full. I then put them in a warm oven of 200F and let the oven dry them out for two hours. After they cool, they are very crunchy and much easier to grind into little pieces with my mortar and pestle. I have a large one so I can put a lot of eggshells in the oven in the bowl and then crunch them up later. After I crush them to very small pieces, I store them in a re-purposed plastic container that looked better before I put it in the dishwasher and melted it a little. However, it does the job. When the girls need their dish refilled, I pour in the crushed eggshells. It should be noted that it is very IMPORTANT to crush the eggshells up in very small pieces so that it isn’t obvious they are eggshells. You do not want to perpetuate your laying hens starting to peck and then eat the eggs and shells they are laying. My girls eggshells are very strong and thankfully, my girls all appear very healthy. 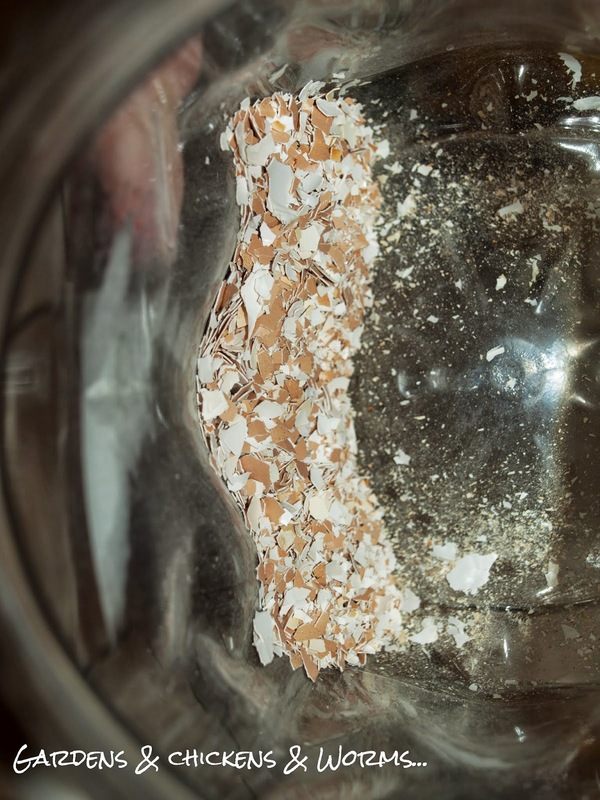 While the oyster shell isn’t really all that expensive, it still helps to save a little on the feed bill by giving them back their own eggshells and who doesn’t like to save money? Finally, I feel better about giving them their own eggshells because I know what I feed them and where it comes from so I know that those healthy eggshells don’t have anything in them that might be added. So the next time you eat some of your delicious eggs from your hens, save the shells and give them back. How small the eggshell pieces? How long can you keep them? I tried the air drying and went back to the oven. It changes the eggshells enough to prevent the girls from eating their eggs, hopefully. I’ve had egg-eating hens before. My girls free range half the day, and we have deer nearby, so I keep food grade DE in all their dust bath wallows, (ever increasing since the heat and the drought started). It supposedly helps kill small insects, like gnats and mites, (and hopefully mosquitoes) according to my local expert. And on another subject, we have fire ants. He said if I combine sevin dust and DE half and half and put a bunch on the ant hill it will kill them all. We have not used a microwave for at least eight years. When I did research on them. They change The molecular structure of whatever you have in there. I air dry in The sun, if possible. If not after I’m done using the oven I’ll put them in to dry with whatever heat is left over. 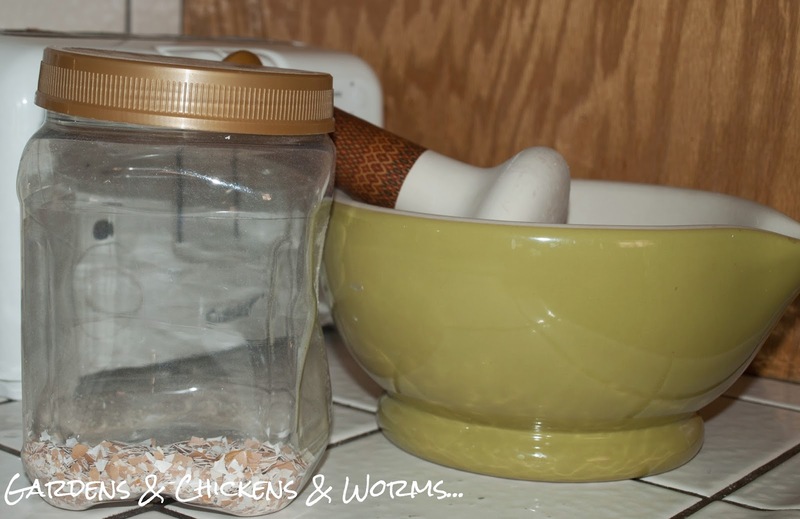 I love hearing about how everyone is giving their chickens back their eggshells. So many great ideas! I live just 25 miles south Yosemite National Park. We have A LOT of predators out here so I can’t put eggshells out in the sun to dry. My girls get their grit from the sand I use in the run and I put DE all in and around their coop & run. I also use eggshells in my garden. I tend to rinse them because they sit in my little compost bucket for several days before I dry them. Another tip is to use the water from boiling your eggs in the garden as well! Thanks Donna. This was an interesting and informative bit of knowledge. I’ll remember this in my future. I just put the shells in a ceramic plant pot on the back porch after rinsing them and letting them air dry. No nuking or oven drying needed. By the end of the day they are brittle and easy to crush in a plastic bag with my feet (shoes on, of course). Simple, simple. My mother grew up during the Depression. When I was a child in the fifties, the dogs age kitchen scraps. Mama always cautioned me not to put egg shells in the dogs’ food unless I browned the eggs first. She said that the dogs might become egg eaters if they developed a liking for the half shells I was going to give them. We put the egg shells for the day in the over after we got through with the oven. The eggs browned nicely, and Mama allowed me to put them in the dogs’ dish out doors. We also “cooked” the shells to give them back to the chickens for the same reason. I had a post about this on my blog. I brown and crush the shells without washing the shells. That is protein you are washing out! So, mine get that protein back also. I do everything I can to cut costs and feed them for free. Using cornmeal I got for free, I make cornbread with their eggs and put eggshells in it. I mix shells in lots of their food. Let’s not forget that oyster shell provides TWO benefits. 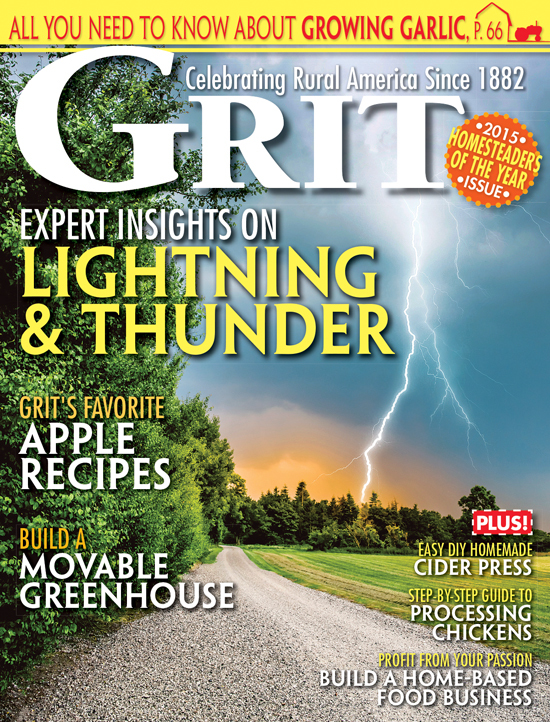 Birds need grit to grind their food and as the grinding action dissolves the calcium. Hens will eat a lot of egg shell (way more than needed), but as with other minerals and vitamins any overage will be expelled from the body. I provide oyster shell/ coral gravel/sand at all times and offer egg shell as a treat sprinkled on the ground. I leave my eggshells in the oven overnight with the oven light on. In the morn they are extremely brittle. I then crush ’em up and scatter them over my gardens where the bird’s free range. Anything they don’t eat returns to the ground as minerals, making for healthy plants. Instigate would be a better word, unless the clucks are already eating their eggs. I prefer egg shells as I feel they are getting back exactly what they are losing and they’re free. Holy cow I think some of you are really over-complicating things though but hey whatever floats your boat. Cooking/crushing isn’t necessary, I’ve never done it and never had pecked eggs. Just toss ’em out there with the scraps. We’re with you on this. 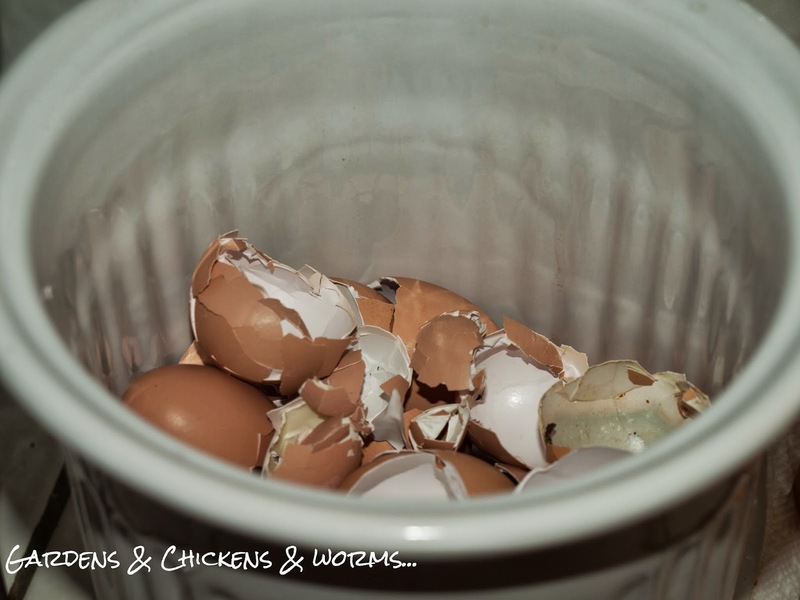 We drop our egg shells in the bucket with the rest of the kitchen scraps and take it out to the compost pile. The chickens and ducks can’t wait to get at all the goodies in the bucket. We never do more than that with the egg shells. We haven’t had a problem with egg eaters since we started feeding back the shells. We did have a problem with egg eaters when we offered unlimited oyster shell, and not egg shells. I use a blender and puree the egg shells with water, put cheesecloth across a 5 gallon bucket strain, put by-product in feeder for chickens and the rest in the garden. It’s good for tomatoes, putting around plants cuts the bellies of slugs, also makes earthworms reproduce under the mulch. The strain water can go into the garden or to the chickens. I always feed their shells back to them and they love them! I’ve never washed them or oven dried them – I just stick them in a bowl for a few days an crush them before I put them in the chicken fort. Works fine for me! I’ve been using the oven method for drying then powdering the eggshells in an old coffee grinder but I have never added DE to it. I use DE in the coop and run to discourage mites. I know that DE is also used for intestinal parasites, but is there any reason to give it if there is no evidence of them? Keep in mind that oyster shells contain coral reef corals (probably more than oyster shells (don’t believe it? Check your bag!). Like Susan, I “nuke” mine… 4 – 5 min on 60% and they crush very nicely in two thick plastic bags with a roller pin(I repurose mine from bulk item bags I get at the local health food store). Another fine source of calcium, and cheaper at least around here, is ARAGONITE aquarium sand. Aragonite is a mineral that started life as some sort of shell, skeletal part, etc. of a marine creature … frequently an oyster, if it comes to that. It’s the same composition as calcite (CaCO3) which is limestone, but has a very slightly different crystal form. The characteristic of aragonite is that it slowly reverts to calcite anyway. If tested, oyster shells may actually have reverted by the time you serve them to the hens; doesn’t make any difference to them. Be sure to read the label carefully though – regular aquarium sand is quartz (SiO2), which won’t help chickens’ need for calcium at all. My chickens don’t seem to be egg-eaters, so I don’t bother to disguise the shells. But I have found that simple air-drying for a few days makes them brittle enough to crush in my hands. I mix these bits with their breakfast treats – seeds, feed, and alfalfa sprouts. I put my rinsed shells in the microwave for 90 seconds then crush them in the blender. I add this (and some DE) to their feed. best way. 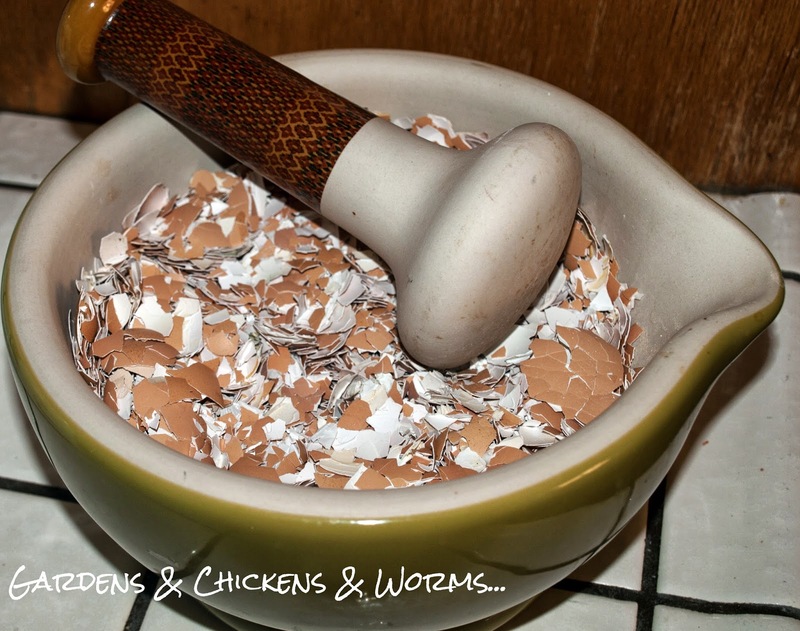 i used to raise pet birds, parrots, and this is the best way to do the egg shells for them. just sprinkle a little on their feed. I noticed when i feed my girls Diatamceous earth and red clay from the feed store their egg shells are great. I coat my kitchen scraps with it….thats how i get them to eat it. Plus its a natraull dewormer!